Inspire My Life! 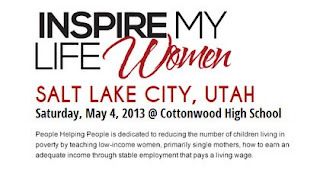 is a new conference coming to Salt Lake (Cottonwood High School) this Saturday, May 4th from 9-5 p.m. There are many wonderful artists and presenters: Charley Jenkins, David Christensen, Vickey Pahnke Taylor, Curtis Jacobs, Daniel Beck, Katherine Nelson, and Jessie Clark Funk. Any donations will go to help single moms at People Helping People.